From current academic titles, to fiction, to primary sources from centuries past, you can find a million books—online and on our shelves. 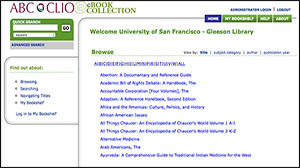 The library catalog lets you search across the holdings of Gleeson Library and Zief Law Library, including books, videos, and other materials. 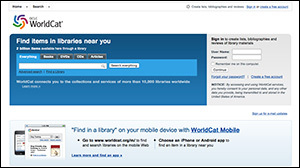 Search across the more than 60 libraries in California and Nevada, and request available books to be delivered to Gleeson Library in 2-4 business days. 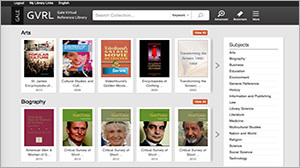 ProQuest Ebook Central offers more than 140,000 ebooks (with unlimited user access) in a wide range of subject areas, along with powerful tools to help you find, use, and manage the information you need. 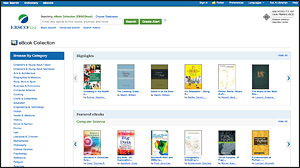 More than 165,000 academic ebooks in a wide variety of subjects. Includes both unlimited access and limited-use titles. 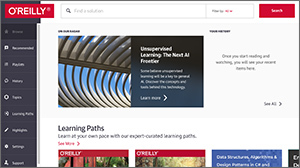 More than 30,000 technical books—including titles from Pearson, O’Reilly Media,and more—organized by popular subjects, from web development and mobile apps to entrepreneurship and UX/IA. Greek and Latin texts alongside English translations. The mission of the Loeb Classical Library, founded by James Loeb in 1911, has always been to make Greek and Latin literature accessible to the broadest range of readers. 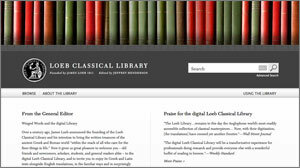 The digital Loeb Classical Library extends this mission into the twenty-first century. Harvard University Press is honored to renew James Loeb's vision of accessibility and presents an interconnected, fully searchable, perpetually growing, virtual library of all that is important in Greek and Latin literature. Epic and lyric poetry; tragedy and comedy; history, travel, philosophy, and oratory; the great medical writers and mathematicians; those Church Fathers who made particular use of pagan culture — in short, our entire Greek and Latin Classical heritage is represented here with up-to-date texts and accurate English translations. 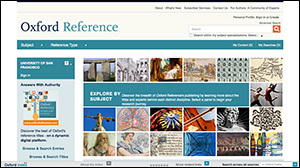 More than 520 volumes of Latin, Greek, and English texts are available in a modern and elegant interface, allowing readers to browse, search, bookmark, annotate, and share content with ease. The online collection is growing to include 5,000 individual volumes, with 650,000 pages and more than a million images. Each book tells a small piece of American history. But when researched together with Alexander Street's Semantic Indexing, the collection becomes a massive and powerful primary-source research tool, a tapestry of the places and people that have made America. For academic scholarship, the collection will have broad departmental relevance, showing the personal stories and photos of immigrants, laborers, and newsmakers; documenting the local architecture of homes and businesses; showing images of racism and tolerance; delivering history as observed in real time. The photos are from historical societies, archives, and private collections. The texts are written by local historians—people with deep and personal knowledge of their communities. In many instances, the authors are protagonists in the historical events they describe, with family photographs, primary documents, and other materials that are inaccessible outside of these publications. Find pictures and descriptions of college football games in Nebraska in the 1950s. Articles from American Psychological Association journals, the full text of APA books, and full text of psychological tests and measures. A collection of over 60 books published by IGI Global on social use of information, social media and organizations working in virtual environments. 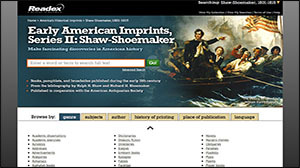 Early American Imprints, Series I: Evans, 1639-1800 has been hailed as the definitive resource for researching every aspect of 17th- and 18th-century America. 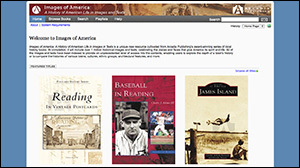 This incomparable digital collection contains virtually every book, pamphlet and broadside published in America over a 160-year period. Digitized from one of the most important collections ever produced on microform, Early American Imprints, Series I is based on Charles Evans’ renowned “American Bibliography” and Roger Bristol’s supplement. 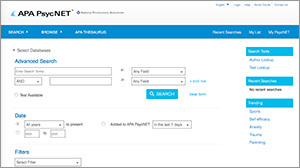 Including more than 36,000 printed works and 2.3 million pages, Series I also offers new imprints not available in microform editions. Early American Imprints, Series I is comprised of a vast range of publications, including advertisements, almanacs, bibles, broadsides, catalogs, charters and by-laws, contracts, cookbooks, elegies, eulogies, laws, maps, narratives, novels, operas, pamphlets, plays, poems, primers, sermons, songs, speeches, textbooks, tracts, travelogues, treaties and more. The imprints in Series I are expertly indexed and may be browsed by genre, subjects, author, history of printing, place of publication and language. Topics covered include agriculture, astronomy, auctions, capital punishment, child rearing, commerce, constitution, diseases, education, foreign affairs, French & Indian wars, geography, Indians, Latin, lotteries, masonry, medicine, military operations, missionaries, operas, religious thought, revolutionary war, slavery, suffrage, temperance, trials, witchcraft, women, work, yellow fever and thousands more. Readex now offers a broad range of recently uncovered imprints, most of which were not included in either Charles Evans’ monumental work or Roger Bristol’s supplement. From the acclaimed holdings of the Library Company of Philadelphia and the American Antiquarian Society come two individually available supplements to Evans, 1639-1800. Together these collections offer approximately 1,750 rare and unique items printed during a 150-year period spanning the colonial era and the formation of the new nation. 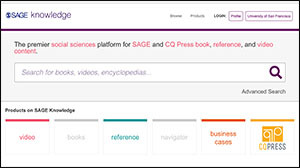 Fully integrated with Evans, these two supplements enable students and scholars to locate relevant material from all three collections simultaneously. It is based on the noted “American Bibliography, 1801-1819” by Ralph R. Shaw and Richard H. Shoemaker. 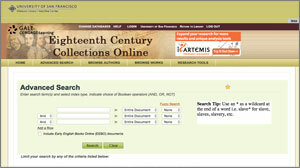 With more than four million pages from over 36,000 items—including 1,000 catalogued new items unavailable in previous microform editions—this digital edition from Readex is an essential complement to Early American Imprints, Series I: Evans, 1639-1800, the definitive resource for researching 17th- and 18th-century America. This incomparable collection now contains more than 125,000 titles listed in Pollard & Redgrave's Short-Title Catalogue (1475-1640) and Wing's Short-Title Catalogue (1641-1700) and their revised editions, as well as the Thomason Tracts (1640-1661) collection and the Early English Books Tract Supplement. 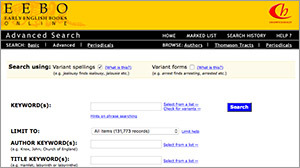 Libraries possessing this collection find they are able to fulfill the most exhaustive research requirements of graduate scholars - from their desktop - in many subject areas, including English literature, history, philosophy, linguistics, theology, music, fine arts, education, mathematics, and science. Digital images of every page of 150,000 books published during the 18th Century. 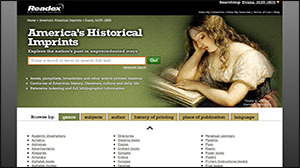 With full-text searching of approximately 33 million pages--in essence, every significant English-language and foreign-language title printed in the United Kingdom, along with thousands of important works from the Americas. History and Geography: Ancient and contemporary history, accounts of voyages and discoveries, historical biographies and memoirs, genealogical collections, gazetteers, works on church antiquities and tourist guides of Britain. Topics include chronologies, recreation (travel, sports, parlor games), military history, maps, local history and topography. It should also be noted that this collection presents a comprehensive picture of the American Revolution from the British perspective. Social Science: Materials on manufacturers and merchants, artisans and skilled workers, and international business, banking, taxation and lotteries. Topics include current events, social reform, business/economics/finance (general advertising, lotteries, trade bills and more), political science (parliamentary papers, political satire, political essays, speech/addresses, handbills, parish registers, poll books and more). Fine Arts, Music, Art and Architecture: Treatises on music, painting, theater and architecture as well as books on building and carpentry, catalogs pertaining to vocal and instrumental music, paintings, prints, drawings, coins and metals and other collectibles, and material about private art collections. Medicine, Science and Technology: Many branches of science, works on applied science and technology, and works and treatises on the treatment of diseases and conditions. Topics include agriculture, cookbooks, military technology, natural philosophy, scientific education and more. Literature and Language: Celebrated eighteenth-century essayists, novelists, poets and playwrights, as well as Shakespeare's plays, poems and collected works. Topics include drama, poetry, ballads, religious poems, grammar, dictionaries, songs from plays, satire, book catalogues and more. Religion and Philosophy: From sermons, Bibles and prayer books to moral and ethical debates and prescriptions for proper conduct. Law: Development of law in the British Empire between 1701 and 1800. Topics include acts, criminal and international law, appellants' cases and more. Reference: Ephemeral material on the whole of life in the eighteenth century. Topics include almanacs, catalogues and more. 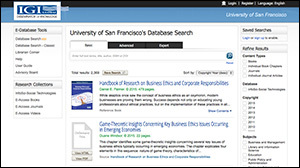 A great place to begin your research, GVRL offers thousands of authoritative articles published in academic encyclopedias, and written by subject experts. Where Wikipedia’s authority can be uncertain, GVRL provides information you can not only trust, but cite in a paper as well. 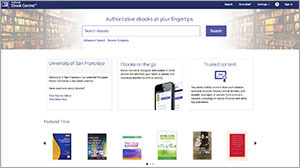 More than 300 dictionaries and encyclopedias covering multiple subjects. 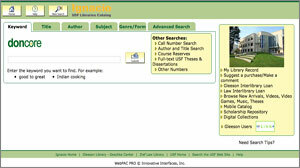 Choose between "Quick Reference" and in-depth "Reference Library" titles. 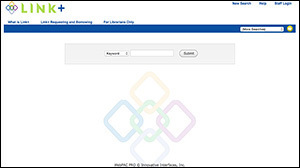 More than 300 encyclopedias, almanacs, and specialized reference sources for multidisciplinary research. 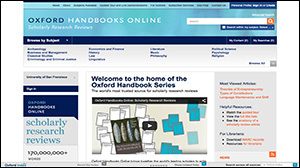 Over 100 encyclopedias, handbooks, and specialized reference sources for multidisciplinary research.